As the Karnataka forest department analyses the data gathered during the six-day tiger census conducted in the state in January, various wildlife organisations have chipped in to identify the population of the big cats based on DNA fingerprinting. "We are looking at identifying the individual tigers based on their unique coat pattern and DNA fingerprinting from scats," Centre for Wildlife Studies Director K Ullas Karanth said. This innovative process (DNA analysis), first developed last year in Bandipur National Park, will be expanded to other sites in the coming months. National Centre for Biological Sciences is the leading institution in DNA analysis work, he said. Currently, tigers are individually identified from camera traps (automated cameras used to photograph nocturnal wildlife) and counted. "The statistical models also tell us what proportion of the tiger population was not photographed, thus allowing us to make estimates," Karanth said. 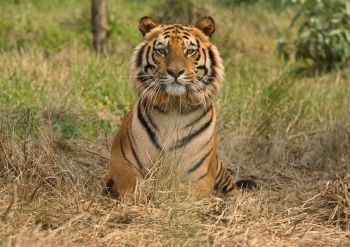 Cameras are placed at select sites to estimate the density of tigers in those areas. Pioneered by Karanth in Nagarhole National Park (recently been renamed Rajiv Gandhi National Park) in 1991, camera trapping has since then been extended to Bandipur, Bhadra, Anshi and Dandeli reserves in the last few years. Also camera trap surveys have been completed in a dozen reserves outside Karnataka between 1995 and 2004. Detailing the advantages of camera trapping vis-a-vis the tiger census undertaken by the forest department, Karanth said the tiger estimation exercise undertaken recently was not used to estimate tiger number directly. The effort there is to primarily measure where tigers are present rather than numbers and densities. For getting those numbers, camera trap surveys should be done. These are calibrated against sign (including pug marks, scratch marks, droppings) data, he said. "Roughly these methods of DNA sampling and camera trapping cost about Rs 20-30 lakh an year for monitoring a typical tiger reserve area. Typically high-density areas, where camera trap usage is not a problem, we prefer camera trap surveys. Other sites with low densities and problems using camera traps, we prefer DNA sampling, Karanth said. The six-day tiger census was conducted in Karnataka from January 22 to 27, which comprised collection of data in all the forests with a size of 10 sq km and above, said Chief Wildlife Warden B K Singh. "A team was constituted for each beat (administrative unit allotted to a forest guard) for all the 2,819 beats in the state for data collection. This data is then passed on to the divisional headquarters and then after total compilation at the state level, sent to Wildlife Intitute of India for final collation", he said. Simultaneously, WII will lay camera traps in represented areas to check the data collected by the states. "Besides forest department personnel, around 1,000 volunteers and technical experts participated in the exercise which was carried out authentically through monitoring teams and observers in high density areas", he said. A 15-km trail was covered in each of the (2,819) beats and sign data collected for the presence of the carnivore. The last three days were devoted to "ungulate (deer, cheetal, sambhar which is food for the carnivore) encounters wherein a one transect spanning 4 km each was created for each beat to trace such hunts by the big cats through rake marks, pellets (faeces) and vegetation survey", Singh said. According to P C Sinha, Director WII in Dehradun, "the census is being carried out across 17 states covering a forest area of over three lakh sq km. In all probability the estimation except in North-east and Sunderbans should be completed by November end". Want to study nuclear physics?